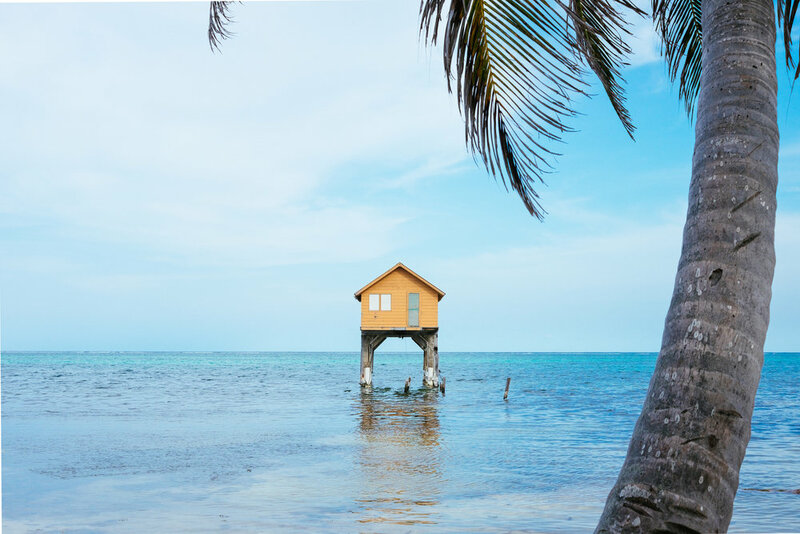 Belize takes all of our favorite things about Central America and the Caribbean - the laid-back culture, the tropical food, the beaches, the adventures - and packs them into one small country. It's home to the largest barrier reef in the northern hemisphere, and you're pretty much guaranteed to find a beach bungalow to crash in for a few days. This guide focuses on the tiny (but popular) island of Ambergris Caye. Best Time To Visit. The best time to visit Belize is during dry season which spans from late November to mid-April, but you'll find lower hotel rates outside this time frame. Costs. Ambergris Caye can be a bit touristy so expect to pay touristy prices for things like food, drinks, and tours. 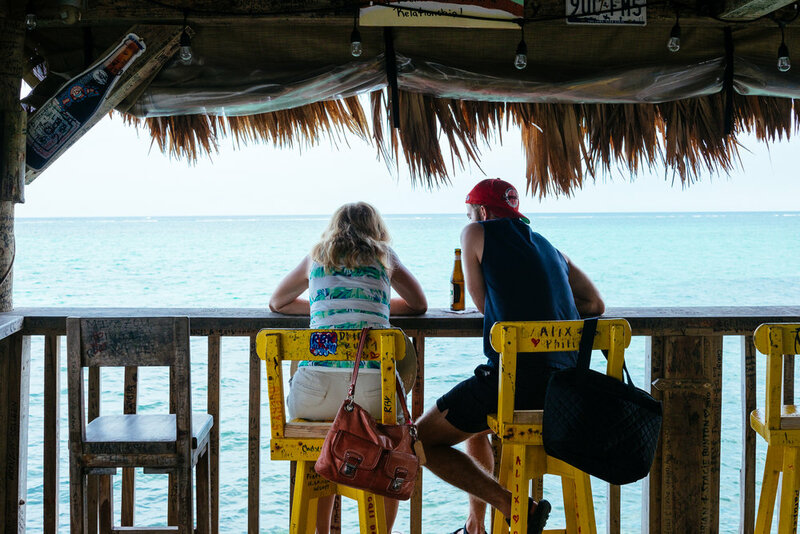 This travel guide has our favorite spots to explore, eat and drink on Ambergris Caye, Belize. Use the table of contents to jump around! Getting here. Fly to Belize City and then take a 15-minute puddle jumper flight on Tropic Air to Ambergris Caye. Getting around. Ambergris Caye isn't very big, but you're going to want a vehicle to get from place to place. Lucky for you, the main mode of transport on the island is golf cart. Your hotel can arrange a rental for the duration of your stay for around $30-40 a day. If you’re traveling with a group or your family, Xanadu Island Resort is our top pick for a stay on Ambergris Caye. Bungalows have common areas like a living room, full kitchen and patio with gorgeous ocean views, making them perfect for groups larger than just a couple. There’s no restaurant on the property, but there is a poolside bar that’s open during daylight hours (you’ll want to stock your kitchen with snacks from the grocery store down the street). The bedrooms could use an upgrade, but you’ll be spending most of your time outside or in the common areas anyway. We think the beach at Xanadu is one of the best on the island. Rates start at US$220/night during high season. Wifi works really well and is included. If you’re traveling as a couple, Victoria House is our favorite option for you. The property is the most stunning in Ambergris Caye. The main house was designed as a modern West Indies plantation-style home and is flanked by adorable casitas in the same style on either side. The beach is immaculate with plenty of shade and a little beach bar. A restaurant on the property serves up fresh seafood and typical Belizean sides. The spa and fitness center are perfect to keep you occupied on a rainy afternoon. Rates start at about US$205/night. Wifi & breakfast included. Book here. We’ve got Mahogany Bay Village on our radar - it's one of Hilton's new Curio Collection hotels. The resort doesn't officially open until December 2017, but it looks like it will be stunning! Something to keep in mind: you're not traveling to Belize for the food. We've found your best bets for food options on the island, but in general we would recommend you keep your expectations low. Ambergris Caye isn't known as a culinary destination and prices are inflated for tourists. When in doubt, order the fresh fish and enjoy the simple things in life :). This little restaurant is in an adorable over-the-water bungalow with tons of outdoor seating and ocean views. It’s a great spot for a leisurely lunch or dinner. We loved the ceviche and fish tacos. A gorgeous restaurant perfect for an intimate dinner inside Victoria House Resort & Spa (see sleep). The interior of the restaurant is beautifully decorated with dark wood trim around white walls covered with chic botanical art. The menu has tons of fresh seafood to choose from - we loved the cashew crusted grouper. A very low key beach bar with some of the best food on the island. A perfect spot to have lunch on a sunny day and linger until evening drinks. We loved everything we ordered - especially the ceviche, fish tacos, and the fish sandwich. Our favorite beach bar on Ambergris Caye. Tiki Maya is on the second floor of a quirky over-the-water dive shop bungalow. Grab a seat at the bar that faces sweeping views of the Caribbean ocean and order a fruity drink (we ordered the strawberry daiquiri without the added sugar and it was delicious!) or a Belkin beer. If it’s a nice day, plan to spend the entire afternoon here until the sun sets. A casual, open-air beach front bar with live music at night. A perfect spot to grab a Belkin beer or a Michelada (Belkin beer with lime juice, hot sauce and spices) after a day of outdoor adventures. 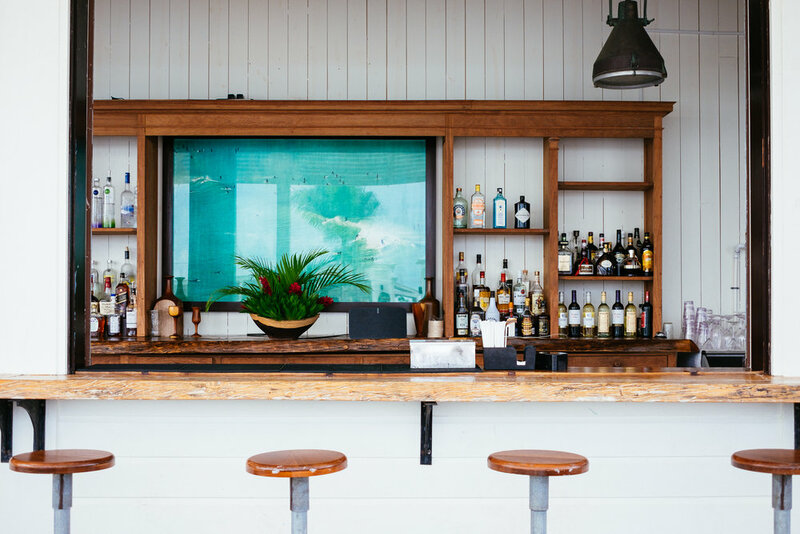 Who doesn't love an open-air bar on a secluded beach? Well, getting here is half the fun (see experience). Once you're here, grab a honey-sweetened margarita and wade into the shallow crystal clear water. You'll have schools of fish swimming around your feet while you soak in the sunshine with your drink in hand. The best coffee on the island is hidden inside Mahogany Bay Village. If you're a coffee snob, this is the only spot you'll be at home in San Pedro. If you're less picky about your coffee, Brooklyn Brothers Bagel Shop will do just fine. It's closer to the center of town and actually has pretty decent bagels too. Closed on Sundays. Our favorite experience on Ambergris Caye was without a doubt snorkeling the Hol Chan Marine Reserve and Shark Ray Alley. We organized a tour through Searious Adventures and had Iver as our guide. Iver was one of the best travel guides we've ever had. He swam in the water with us and helped us get up close and personal with tons of wildlife: all the fish, way too many sharks, sea turtles, eels, sting rays, lobster and starfish. If you're going to do one activity while you're in Belize, this would be our top pick! A "secret" beach that's hidden up on the north side of the island. It's a bit of a drive in your golf cart with some rough roads, but that's half the fun! Rainy day or early riser? Stop by Science and Soul Wellness’ gorgeous spanking-new studio in Mahogany Bay Village for a little self care. Rest those tired muscles after a day of snorkeling at the spa at Victoria House. We were in heaven after our deep tissue massage.